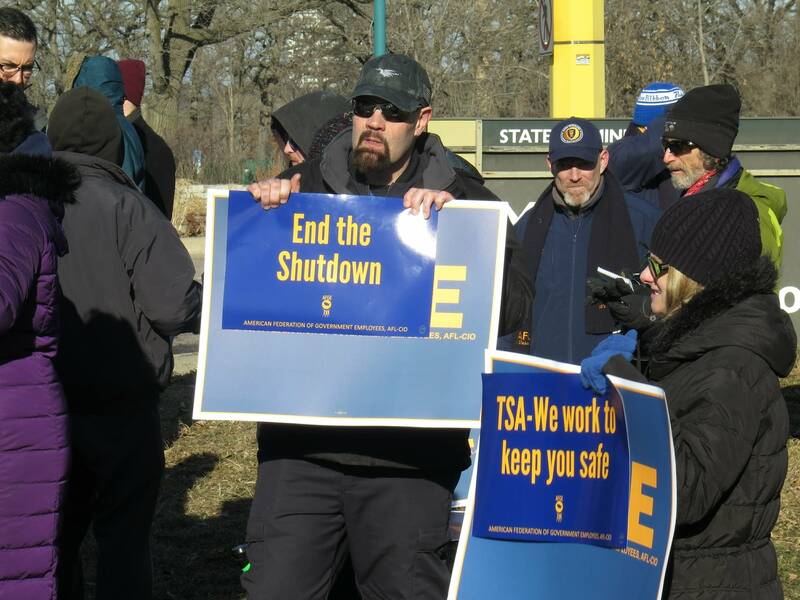 TSA agent Scott Shane, center, takes part in a rally with other federal workers and their supporters in Minneapolis on Thursday. Matt Sepic | MPR News. Friday is the first payday without a paycheck for thousands of Minnesotans who work for the federal government. Transportation Security Administration agent Scott Shane is still reporting to work at the Minneapolis-St. Paul International Airport. He was among two dozen people who attended an afternoon rally on Thursday in Minneapolis, demanding an immediate end to the partial federal government shutdown. "I honestly love the people I work for. I love what I do and I love the mission," Shane said. "But we need our paychecks. People need to make their livings, they need to pay their mortgage and car payments and food for their families." Shane, who commutes 54 miles each way from Monticello, Minn., said he's keeping a close eye on the family budget. But he's hopeful that he'll get back pay once Congress and the president agree on an appropriations bill. Like airport screeners, FBI agents are also deemed essential. Minneapolis field office spokesperson Kevin Smith said the bureau is still operating even though employees are not being paid. "We don't want it to be perceived that we're not open for business," Smith said. "We are open for business. Anyone with information or who wants to provide a tip to the FBI is encouraged to reach out to local offices or go to the website." It's not just federal workers who are feeling the shutdown's sting: Businesses, farmers and state agencies that depend on nonessential federal employees are finding they have to wait. Greg Olson, an Eagan real estate agent, said that he fears a client's purchase of a new manufacturing building could fall through because no one from the Small Business Administration is available to sign loan documents. "If the seller gets tired of waiting and decides to go elsewhere, my client is out thousands of dollars and I'm out about the same amount of money on my commission. That's a good part of my personal budget," Olson said. Also in limbo are many farmers. Robert Craven heads the Center for Farm Financial Management at the University of Minnesota. He said already-strapped dairy farmers can't access U.S. Department of Agriculture loans. And some farmers who grow row crops aren't getting the aid payments they were promised that were meant to offset the impact of the trade war. "I assume people that are in a bit of financial crunch, the lenders are going to be understanding that it's money that's coming, it's just we won't know until the government gets back on its feet," Craven said. • Share your thoughts: How is the shutdown affecting your life, work? At the Minnesota Department of Natural Resources, wildlife research manager Lou Cornicelli said a deer cull due to start Monday won't happen. "It falls into the category of things you didn't realize would be affected by a shutdown. But there's not much we can do," he said. Specially-trained USDA hunters were planning to come to southeastern Minnesota to remove deer with chronic wasting disease. Cornicelli said that task — which must be done in the winter — will have to wait until the federal government is back to full strength. MPR News reporters Dan Gunderson and Euan Kerr contributed to this report.